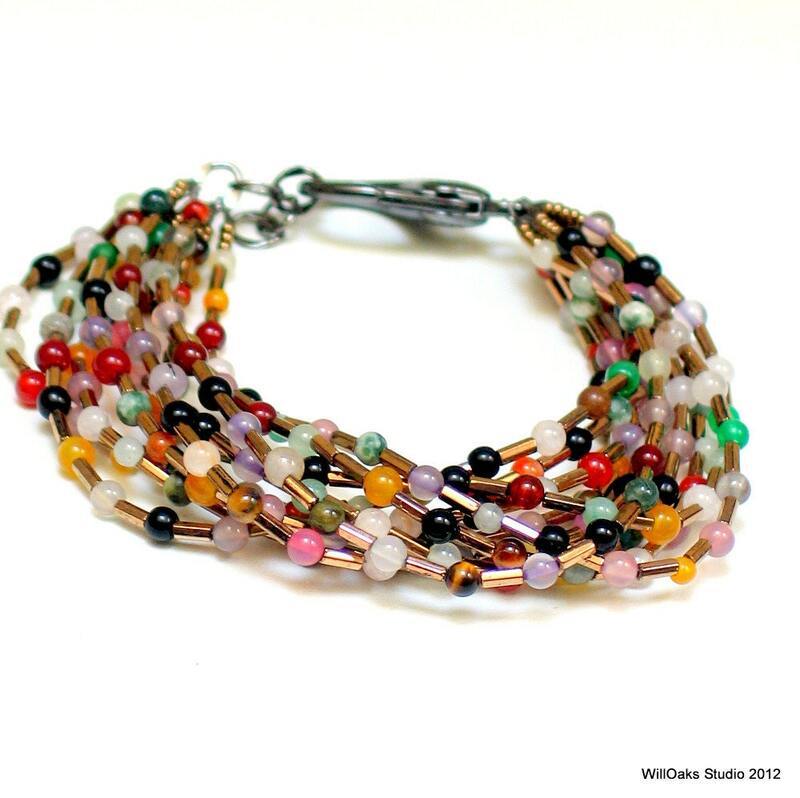 The colors of a full spectrum of gems glow between faceted antique gold colored vintage bugle beads for a bold statement bracelet--a bright, rich original to wrap around your wrist. Ten individual strands jostle for space, mix and mingle and are gathered to a large bold gun metal lobster clasp and a small length of matching chain. 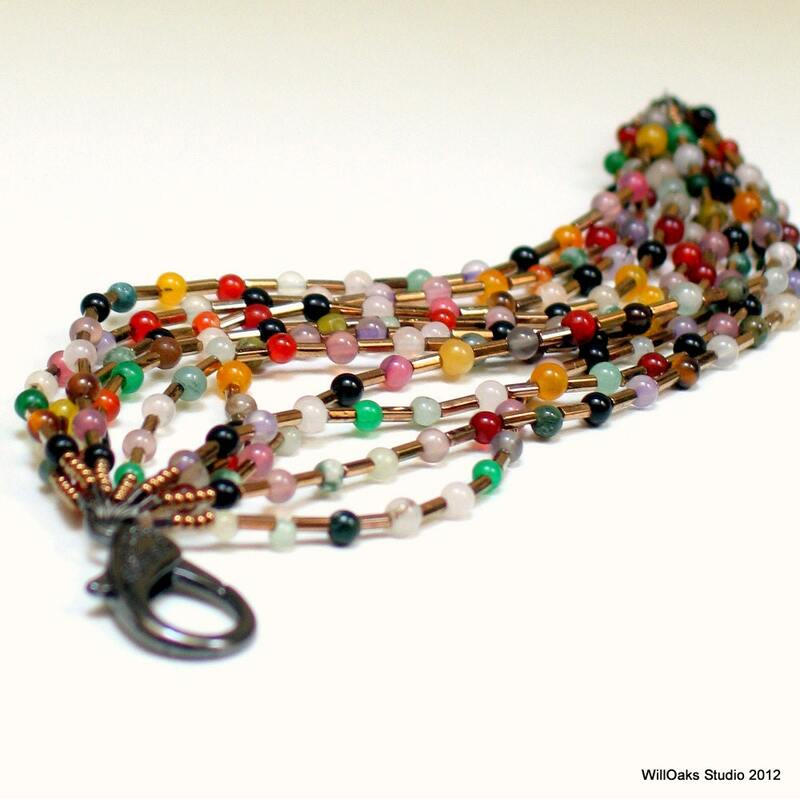 The cluster of beaded strands measures 8" laid flat and can also be worn twisted for a different effect. Carefree Bohemian in feeling and a touch of the Hippie in style, while right at home worn for work or for play. These pieces cross seasons, styles and coordinate with everything you wear! The 3 mm to 4 mm stone beads are natural and dyed agates, quartz, jasper and many other stones used in random mixtures, balanced for a full spectrum of colors, but each bracelet will be unique. 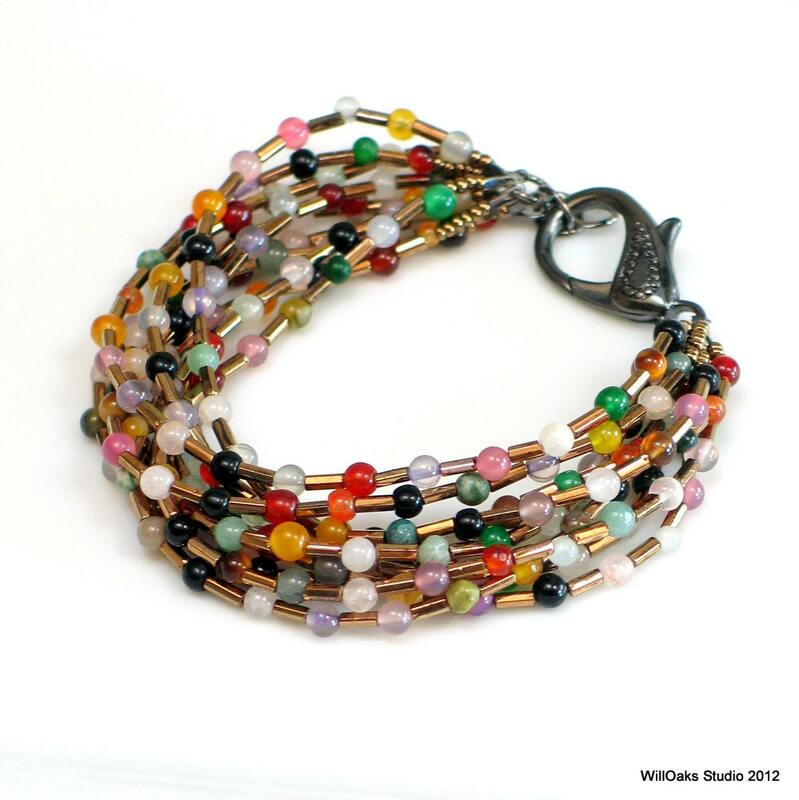 I collected gemstone beads in this smaller size for a long time before I decided to create my own mixtures of colors and stones, which together with either vintage or current Czech beads in metallic finishes, became the basis for my "Tapestry Series." The 8" length of this bracelet fits most wrists due to the thick cluster of strands, and can be adjusted to be worn longer with the extra links in the chain. The delightful vintage antique gold colored bugle beads are faceted and the facets glint in the light: there is a rich metallic depth to this tapestry of color. You can find coordinated earrings here https://www.etsy.com/listing/116769586/bright-beaded-hoop-earrings-sterling and a long layering necklace made of similar beads and meant to coordinate here https://www.etsy.com/listing/120612892/colorful-gemstone-and-vintage-bead-long This is a limited edition original design. Packaged in a velvet pouch for storing and for gifting. Mailed first class with tracking numbers and delivery confirmation. 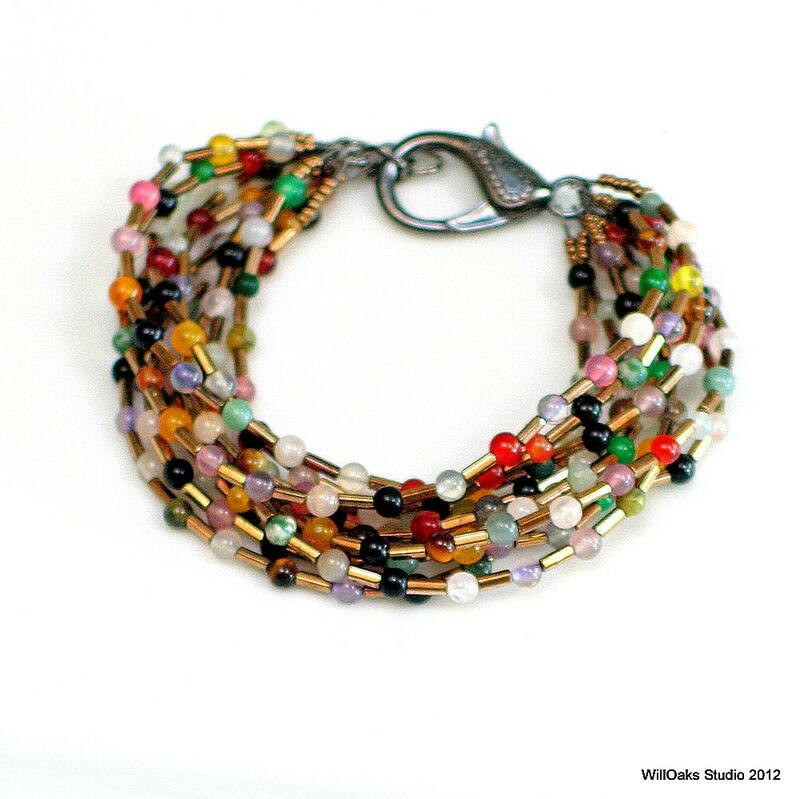 See more bracelets and cuffs here https://www.etsy.com/shop/WillOaksStudio?section_id=5804697 and see more of the "Tapestry Series" listed here https://www.etsy.com/shop/WillOaksStudio?section_id=12313922 for earrings, long chains and other bracelet designs.